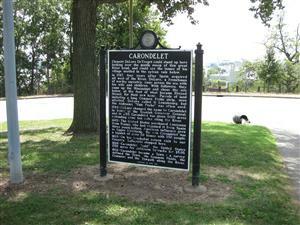 Directions: The Carondelet Historical Marker [ Waypoint = N38 33.631 W90 14.540 ] is located in Bellerive Park at the corner of S Broadway and Baker Streets in St. Louis, Missouri. Return to your car and head south on 2nd Street. After about 0.5 miles, turn left (east) onto President Street. Take the ramp onto I-55 south. After about 2.2 miles, take exit 203 towards Bates Street. Turn left (east) onto Bates Street. Take the first right (south) onto Minnesota Avenue. Take the first left (east) onto Bellerive Boulevard. The entrance to Bellerive Park is about 0.2 miles ahead. Find a place to park; the historical marker is at the southern end of the park. Description: Carondelet was the location of a significant boatyard run by St. Louis engineer and businessman James Eads. The following description is attributed to the Missouri Civil War Museum's website. Many ironclad ships of the Union's brown water fleet navy were built by James B. Eads & Co. at Carondelet, Missouri (a city now incorporated within the city limits of St. Louis). 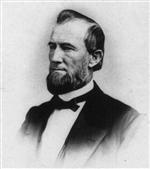 Eads was a well known riverboat salvager and engineer in St. Louis at the time of the Civil War. Construction on the boats was primarily at Eads’ Union Marine Works (also known as Union Iron-Works or Marine Railway). Eads’ facility was located just north of Jefferson Barracks at the confluence of the River des Peres and the Mississippi River. The boatyard was formerly known as the Carondelet Marine Railway Company and it was situated at the terminus of Marceau Street off of South Broadway. It consisted of a series of tracks and cranes that could transport ships in or out of the river using a railway car. The railway car could move a short distance into the water, then up a shallow slope and into one of the handful of sheds where 800 artisans, laborers and shipwrights were employed. The yard was built in the 1850's by Primus Emerson and then leased to James Eads for his operations. To support the shipyard operations, Eads also had at his disposal a rolling mill, five sawmills and two metal foundries all designed to supply his materials. Clement DeLore Treget could stand up here looking over the gentle sweep of this great river bend and could see the homes and his village nestled in the sylvan vale below. In 1767, four years after Spain acquired all west of the River, DeLore, a Frenchman of worthy ancestry, came across the sea with his wife and children. With followers, they came up the Mississippi and chose the site below, at the foot of what became Elwood Street, for their new home. Parcels of land including a long Common Fields strip, were allotted. DeLore called it Louisbourg, but the nickname "Vide Poche" was often used. 1794 - DeLore changed the name to Carondelet in honor of the Spanish Governor General and in 1795 Carondelet was given 6000 acres extending some ten miles along the river. 1803 - The United States purchased Louisiana from France who had regained it from Spain three years before. American influence grew in Upper Louisiana. By now Carondelet was a hamlet of some 50 homes with 250 people. 1825 - On his triumphal return visit to our Country, Lafayette stopped here. 1826 - Carondelet "sold" the United States 1700 acres for Jefferson Barracks for $5.00. 1832 - Carondelet became a Town - a survey defined the Town, the Common Fields, the Commons and the Towpath along the River. 1835 - A Catholic church of stone replaced the first one of wood, built in 1819. The Convent of the Sisters of St. Joseph, with a notable school for girls, was started in 1836. The first Protestant church, Presbyterian, was built in 1850. Soon there were many other churches. 1851 - Carondelet, with 1200 people, became a City. A great industrial impulse began; the railroad was built; large plants arose; general business and population grew. 1860 - Turmoil, confusion and bitterness brewed up with the coming Civil War - then men went away to both Armies, North and South - and Carondelet built "Lincoln's Gunboats." After the War, things became placid again with industry growing and life pleasant. 1870 - The City of Carondelet was joined to St. Louis. Much followed thereafter: Carondelet School in 1871; the first public school kindergarten system in the United States started at the Des Peres School in 1873; beautiful Carondelet Park; Carondelet Library for books and Meetings. The people of Carondelet came from many backgrounds: French, early American, German, Irish, African, Spanish, British, Italian, Polish and others - quite varied in qualities and nature but all worthy and respected. All those who have lived here still think of it as age-honored Carondelet settled down along the Mighty Mississippi River.